Thick verses thin – blades for the #112 Scraper Plane. 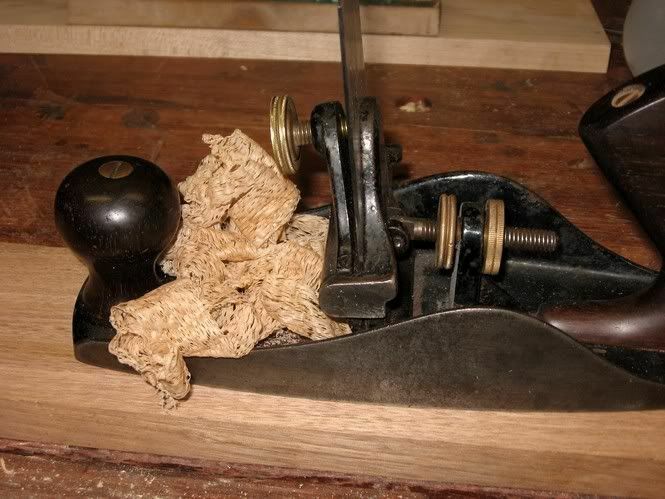 I have had a Stanley #112 scraper plane for about 10 years. It came with a thin blade, the standard Stanley fare. I used it for a while, never really made it work very well, and eventually bought the thick Lie-Nielsen “Stanley Replacement” blade for the plane. 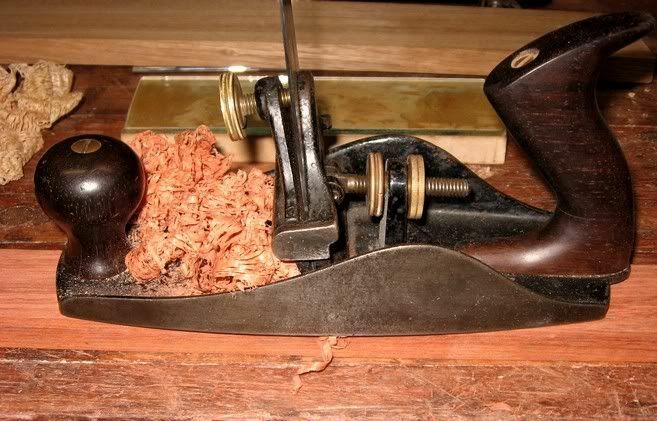 I had read on forums, such as Badger Pond, that this was the way to go, in the same manner that thick plane blades were an upgrade on the thin original Stanley bench plane blades. Blades for the #112 are ground in the same way as bench plane blades. LN suggests that their model, which is the same design as the vintage Stanley, be used sans hook. The hook is only recommended for advanced users. I have a memory that the LN blade originally came with a 60-degree bevel. 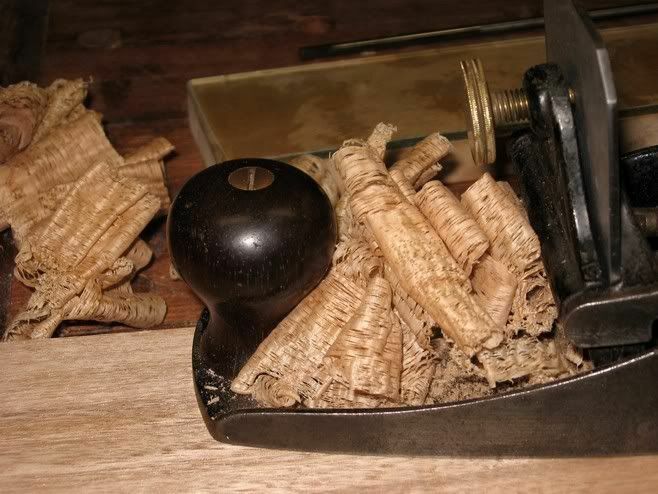 At any rate, I reground it to 45 degrees in line with the blade in my Stanley #80 scraper plane. In recent years I have been grinding the primary bevel at 30 degrees. This creates an edge with greater penetration (i.e. “sharper”) and I believe that the steel (probably 01) would not be compromised compared to a 45-degree primary bevel. I have not used the Lee Valley/Veritas #112, which has the capacity for a thick and a thin blade. So still struggling with ‘flu and lacking the concentration for a long project (such as the Tallboy that is now languishing in the corner), I decided to instead spend this afternoon answering this question for myself. I needed a thin blade, so decided to make one out of a piece of saw blade that was the right size and hardness. The big belt sander is a great tool – hardly ever been touched by wood, I use it for grinding metal. The steel was flattened, and both blades were honed up to 8000 on a Shapton waterstone. The thin blade was given a primary bevel of 35 degrees while the LN continued with its 30 degrees. Both blades were slightly cambered ala a smoothing plane. Both blades were given a fine hook with a thin carbide rod I use as a burnisher. On both card scrapers and scraper planes I use the same hook. This is about 5-10 degrees to the bevel face. This means on a card scraper with a square edge I go 5-10 degrees off the square top (having first raised an edge). On the beveled edge of the scraper plane I site this off the bevel angle (and do not raise an edge). I use a thin carbide rod. This requires less downforce than the thicker rod on the Crown burnisher I used to use. 5 light strokes are sufficient to raise a fine hook. You can get away with 3 strokes for an even finer shaving. (This is a hard area to quantify as a "light stroke" is open to wide interpretation). Behind the blade is my carbide burnisher. In front of this is the glass setting plate I use for woodies and scraper planes. The thin blade measured 1.25mm or 3/64” thick. The LN measured 2.6mm or 7/64” thick. I started with the thin blade in the #112. This was a surprise on two scores - I was not prepared for the high-pitched screeeeeech it made as it moved across the wood. Good grief! But … the thin blade worked exceptionally well. 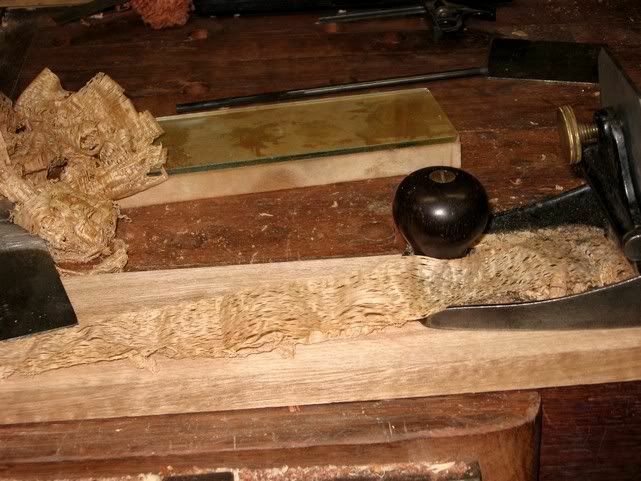 Later, Paul Hamler wrote to say “all that the screeching is caused by the scraper gods not being happy with the relationship of the angle of the burr, the initial depth setting of the blade and the pitch setting of the frog. In order to keep the gods happy all three must be set proper”. The thin blade had a “soft” feel – as if it was flexing as it scraped. It also appeared to feel twitchy, that is, it required more effort to keep it straight. It seemed to want to move around the board. By contrast, the thicker LN blade required a little more force to push, but it was silent (!) and it had a firm, purposeful feel to it. Both blades left the wood smooth as a baby’s watsit. Both thin and thick blades worked well. The thin blade surprised me just how well it produced shavings and the great finish it left. But I could not live with the sound it made – worse than a power router! Happily, the thick LN blade performed as well, or better, and did so effortlessly. I think that I will stay with it.